I never thought I could be a digital planner type of person. Starting from back in the 90s, when all the Asian girls in New York had planners, I had my own cutesy one from Morning Glory full of sticker pictures and notes from my friends and I carried it everywhere. These days, with actual grown-up responsibilities to juggle, I need a planner more than ever. But I’ve searched far and wide and have not found the perfect one to suit my needs. It seems most people use either the classic option, Filofax, or the newer Passion Planner. Some people just use Microsoft Outlook, or reminders on the native calendar application on their phones. But none of those options are robust, customizable or versatile enough to help me keep track of ALL the projects I have going on for work and my personal life. So instead of buying another paper planner that was only going to disappoint me again, I decided to put my Evernote account to greater use and configure it to be my planner. 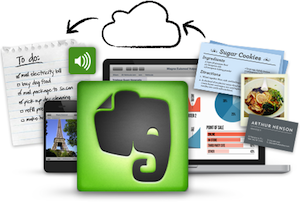 Evernote is software that allows you to store, organize an sync notes, photos, voice memos, web pages, and just about any kind of digital media, across all of your personal devices. I then created a notebook called @Long-Term Goals. I created eight separate notes within it for broad goal categories, such as Health & Fitness, Finance, Career, etc. I listed them roughly by order of importance, and numbered them so they would appear in the same order every time I look at the list. In each note, I created a bullet-point list of my most ambitious, long-term goals in each category. Under Health and fitness for example, I put my target weight and my goal of figuring out how to sleep 7-8 hours a day. Under Finance, I put all the big-ticket items I eventually want to buy over the next few years, i.e. an apartment and a car. I limited these lists to very simple, one word or one line items with no explanations–just visual reminders of what I’m working toward, which I can refer to or change whenever I want. I then created a “stack” (or group) of notebooks corresponding to each numbered goal category in step 3. The stacks are comprised of notebooks labeled by sub-categories. For example, under the “Health & Fitness” stack, I have one notebook dedicated to food and energy, one to workouts, and one to medical stuff. Under Youtube, I have one notebook called WIPs (works in progress) and one called Complete. I did the same for my Blog stack. The important thing to keep in mind while deciding how to organize your stacks and notebooks is that everything should be helping you track and plan to meet the goals in the @Long-Term Goals file. You can save photos, screen shots and voice memos, so you can enter the information any way you want. In the Health & Fitness stack, I use the medical notebook to save medical information like insurance documents. I have a notebook called Workouts where I enter everything I do at the gym every week, using my iPhone. In another notebook I labeled “Food & Energy,” I keep track of the vegetable and fruit combinations I’ve tried for juices, and healthy recipes. I log my weight everyday in an app called My Weight, which syncs with the Health app in iOS, so I take a screen shot of the Health app chart showing my progress every week and upload that, too. Meanwhile in my Finance stack I have a notebook called @Accounts where I created notes to keep track of my fixed budget, my savings, etc. In the stacks for creative projects, like for my blog and my Youtube channel, I have a dynamic, master note in each WIPs notebook called @Ideas. Here, I list all the ideas I have for new projects, with some quick notes to remind myself what I’m thinking (nothing too elaborate). I will be able to access this file quickly from any device whenever something comes to my mind, and add to it the way I might jot something down in a note pad or physical planner. If I’m in a rush, I can just use my iPhone to create new notes in my Inbox, then copy and paste them into the appropriate @Ideas file later on when I have a minute to sit down. To expand on any one idea, I create a new note in the same notebook. I label the note with whatever the idea is, then take down more details and thoughts, or write a draft of a blog post or video script, etc. Then I use the “copy note link” function in Evernote to link each item in the @Ideas note to the appropriate file. This way I can use the @Ideas note as an index where I can quickly find a specific idea, and click on a hyperlink to jump right to the document with all my notes on it. When I complete an idea, I move the note to the “Complete” notebook and delete mention of it from the @Ideas index note. Don’t forget to include life goals that don’t necessarily have anything to do with productivity. It is, or should be, part of your daily routine. So I have one goal/stack for Social, which basically encompasses anything having to do with friends or family. That’s where I keep any notebooks or actionable items related to other people, gift idea lists, etc. I also have a notebook stack called “Personal Growth” where I keep notebooks for my various hobbies and projects that are not work-related. For example, I like cooking so I have one notebook for recipes, which I use in combination with the Evernote Web Clipper and Evernote’s Food app (I’ll tell you more about these another day), and another one for travel to keep track of my travel plans. Evernote enables check-mark lists, so I use those to create to-do lists in the different categories. I use the reminder feature to set reminders for myself to get them done. For actual appointments and scheduling, I use the calendar app, which also syncs across all the same devices. In the Calendar app, I created reoccurring events for things that I do every day, or every week. Even though I don’t always follow this strictly because I might work late one day or change things around on another day, it helps to visualize my schedule so I can quickly check the app to see when I’m supposed to be free, and so I don’t make conflicting appointments and forget to do something important, like set a block of time aside to pay my bills. I still use the native Reminders app on my iPhone, which also functions like a check-list. But it’s useful because it allows me to quickly make grocery lists, packing lists and things like that are useful to have on my phone so I can check it when I’m out. This can be customized to whatever your needs are. For example, if you’re a parent, you could make a notebook stack called “Kids” and create a notebook for each of your children, under which you could save notes about their soccer games, their teachers and grades, their meals, medications, etc. Like this, I can manage my projects from any mobile device I have, even when I can only bring my phone with me and nothing more. It saves me the hassle of carrying a book and pen around and worrying about losing it, and makes it easy for me to enter all kinds of information, not just written information. I can set up alarms and reminders, but also visualize what I’m doing and whether it is moving me closer to accomplishing my long term goals. Best of all, I can record all of my ideas and easily go back in and move them around, expand on them and organize them–something that would be much harder to do with a written journal. I hope this helps some others out there who sometimes feel overwhelmed, like I do. Are you a person with a lot of things to keep track of? How do you do it? Would you be willing to try this method?